Beginning next year, SDOT will be undertaking a major repaving project in Wallingford and Green Lake, including repaving on 40th, 50th, Green Lake Way, 80th, over 500 upgraded accessible curb ramps and more. 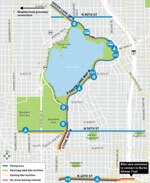 For a full rundown on the project, see SDOT’s Green Lake and Wallingford Paving & Multi-Modal Improvements page and offer your feedback online through the paving project Online Open House. Better yet, get yourself to one of the in person, live, face-to-face (“retro”) open houses coming up at the Good Green Lake Library. First appeared on Wallywood. Click here to Read the full story on Wallyhood » .